Now available at no cost to ARUP clients and easily accessible through ARUP Connect, our dashboards empower clients to observe ordering patterns and affect change in real time. Quickly and easily monitor your sendout volumes and spend, look at test-ordering trends, and review individual provider ordering patterns. Submit a request to see your lab's data in utilization dashboards. 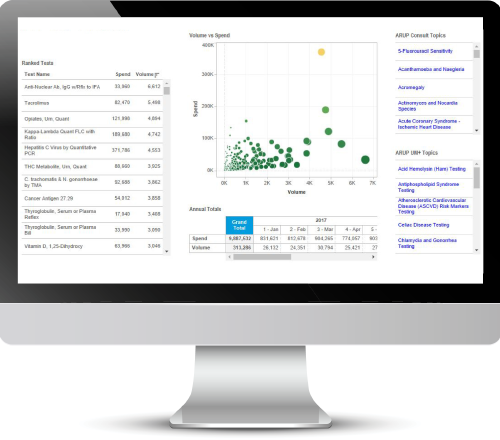 Target easily identify lab testing outliers and opportunities based on volume and spend. Utilize the integrated ARUP Consult and ARUP UM + Topic for additional information on test ordering best practice guidance. Quickly determine annual or monthly sendout spend. Sort your tests by cost or volume. Filter by commonly misordered or generally preferred testing; search by ARUP test number, test name, or physician name. Monitor utilization trends by UM categories over time. Monitor and track your laboratory initiatives and interventions month by month. Benchmark facilities within your various hospital locations within your organization by lab testing volumes and spend. Compare physician ordering and identify utilization outliers.